Heritage Bespoke Saddles & The Custom Made English Saddle Company are a family run saddle & tack manufacturer. We have been supplying the trade, and now the public, with high quality English saddlery and tack for generations. We are based in Walsall, England and ALL our saddles and tack are made in Walsall England. A 100% English Company in every way. We specialise in awkward fit horses, especially riding horses with very big, shoulders, high withers and tall riders. Matthew has recently developed the LS or Large Shoulder Yin-Yang Jump/Event saddle (Patent pending). This is a special saddle design that combats the "smothering" and restriction of the horse's shoulders, which can result in injury, poor development and performance. Our design allows movement through the shoulders and development will improve greatly whilst still allowing the longer legged rider the forward cut flap they need for jumping disciplines. Please see the rider testimonials page for the feedback, on our LS models, by our happy customers fro all over the world. Contact Matt for more details on the LS's and read all about it on the Jump/Event page on this website. We also specialise in all awkward horses of all types with issues such as.... very wide, very narrow, unbalanced conformation, Barrel shaped, no shoulders, very high/long withers, no withers, tall, large, long legged riders and all other problems one may have with rider/horse harmony and saddle fitting problems. We have the answer as we make the saddles not just sell other brands and "alter" them to fit! 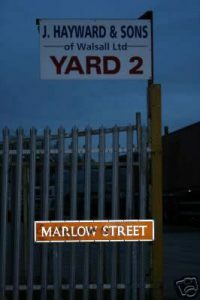 Marlow street in Walsall. Site of an earlier Marlow family premises. We supplied the Persian army in 1971 (To mark the 2,500th anniversary of the Persian monarchy when our own queen visited), supplied Polo saddles to Indian Maharajahs, film stars and many celebrities. We also made and supplied all the saddles, bridles and harness (when we were called Global Saddle Co') to Paramount pictures for the multi-million pound movie King David, Starring Richard Gere and Edward Woodward in 1984. All of our saddles and tack are produced in Walsall England. The true home of high quality saddlery. We only use the very finest quality English leather and suede in all our products, and all our products are made by the some of England's best saddlers to the very highest standards. Matthew now runs the family business and is the company saddle fitter, something he has been doing for over 25 years. He was trained from leaving school by his father who, until his recent retirement, was involved in the business for 65 years. Matthew's Great Grandfather Joseph Thickett was the Mayor of Walsall from 1923 and interestingly Marlow Street in Walsall (see photo) is the site of Matthew's great great Gradfather's premises many moons ago. 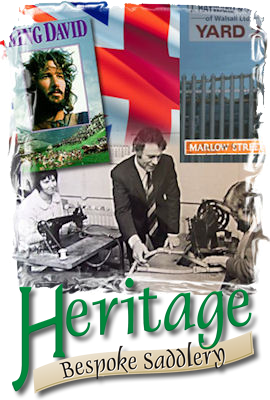 This all highlights the influence and history the Marlow family have had in the town of Walsall over many years in the saddlery industry and public service. In fact there are large blown up photographs (like the one of our old factory below) in the saddlery museum, in Walsall, that were taken of our workshops and saddlers years ago. Matthew is a time served, proper saddle fitter. He has fitted 1000's of horses in his long career and awkward shaped horses are his speciality. He will travel to you wherever you are in the UK or Europe, and indeed the world, to measure your horse/horses and will offer priceless advice and guidance. 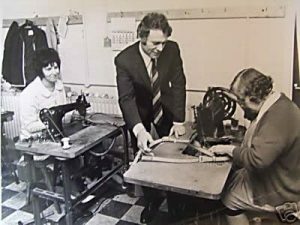 Brian Marlow, Matt's father (1971) in our Walsall factory with two of his staff Marg and Lilley. We will then Custom make you a saddle that will fit you and your horse perfectly. Matthew does not turn up with a van full of saddles and leave after selling you a saddle that doesn't really fit. Neither will he go away and find a saddle that is already made,alter it, then tell you it was custom made for you! ALL our Custom made saddles are just that, lovingly custom made from scratch, for you and your horse's unique shape and requirements. A true bespoke service. On the very rare occasion we have an off the peg saddle that is suitable we will be happy to supply this. We have many Ex-Demo and new saddles in stock. Please call to arrange a viewing. We make all styles of saddles and specialise in Show, Working Hunter saddles, General Purpose, Cross Country/ Eventing Saddles/Jump Saddles, Dressage, Endurance saddles. Polo, Icelandic and many styles of close contact /mono-flap jumping saddles. We have designed the new Yin-Yang range of saddles for 20010/2011 seasons. Stunning saddles that are at the cutting edge of saddlery design. We also offer a custom made bridle and tack service too for those horses with outsize, small and awkward shaped heads. Dressage, Atherstone, Humane leather Girths, stirrup leathers, show Bridles, Plain Hunter bridles, Weymouth Bridles, Stud Guards and all other related items can be made specially for you and your horse.